Treat yourself to the KORRES Total Indulgence Bergamot Jasmine and Japanese Rose Body Milk and Shower Gel Collection, a gift set containing four products to cleanse, hydrate and care for skin. Uplifting Bergamot notes and blooming Jasmine gardens. Creamy-foam showergel with Wheat Proteins and Althea extract, helps maintain skin’s natural moisture levels. Uplifting Bergamot notes and blooming Jasmine gardens. The combination of Almond Oil, active Aloe, Provitamin B5 and Shea Butter provides long-lasting hydration while enhancing skin suppleness. Velvety, sweet essence of Rose Buds. 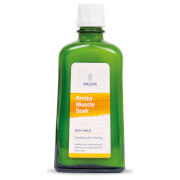 Creamy-foam showergel with Wheat Proteins and Althea extract, helps maintain skin’s natural moisture levels. Velvety, sweet essence of Rose Buds. The combination of Almond Oil, active Aloe, Provitamin B5 and Shea Butter provides long-lasting hydration while enhancing skin suppleness. Shower Gel: Lather onto skin and rinse off with water. Bergamot Jasmine Shower Gel: Aqua/Water/Eau, Sodium Laureth Sulfate, Cocamidopropyl Betaine, Sodium Cocoyl Isethionate, Coco-Glucoside, Glyceryl Oleate, Parfum/Fragrance, Aloe Barbadensis Leaf Juice, Althaea Officinalis Root Extract, Arginine, Benzyl Alcohol, Benzyl Salicylate, Castoryl Maleate, Citric Acid, Citronellol, Geraniol, Guar Hydroxypropyltrimonium Chloride, Hexyl Cinnamal, Hydrolyzed Wheat Gluten, Imidazolidinyl Urea, Lactic Acid, Phenoxyethanol, Polyquaternium-7, Potassium Sorbate, Sodium Benzoate, Sodium Chloride, Sodium Dehydroacetate, Sodium Gluconate, Tocopherol. Bergamot Jasmine Body Milk: Aqua/Water/Eau, Caprylic/Capric Triglyceride, Prunus Amygdalus Dulcis (Sweet Almond) Oil, Glycerin, Hydrogenated Polydecene, Glyceryl Stearate Citrate, Ammonium Acryloyldimethyltaurate/Vp Copolymer, Butyrospermum Parkii (Shea) Butter, Decyl Cocoate, Parfum/Fragrance, Aloe Barbadensis Leaf Juice, Benzyl Salicylate, Caprylyl Glycol, Cinnamyl Alcohol, Citronellol, Distarch Phosphate, Eugenol, Geraniol, Glycine Soja (Soybean) Oil, Hexyl Cinnamal, Hydroxycitronellal, Lactic Acid, Magnesium Pca, Manganese Pca, Panthenol, Phenoxyethanol, Rosmarinus Officinalis (Rosemary) Leaf Extract, Sodium Gluceptate, Sodium Pca, Zinc Pca. Japanese Rose Shower Gel: Aqua/Water/Eau, Sodium Laureth Sulfate, Cocamidopropyl Betaine, Sodium Cocoyl Isethionate, Cocoglucoside, Glyceryl Oleate, Parfum/ Fragrance, Aloe Barbadensis Leaf Juice, Althaea Officinalis Root Extract, Arginine, Benzyl Alcohol, Castoryl Maleate, Citronellol, Guar Hydroxypropyltrimonium Chloride, Hydrolyzed Wheat Gluten, Hydroxyisohexyl 3-Cyclohexene Carboxaldehyde, Imidazolidinyl Urea, Lactic Acid, Limonene, Phenoxyethanol, Polyquaternium-7, Potassium Sorbate, Sodium Dehydroacetate, Sodium Gluconate, Tocopherol. Japanese Rose Body Milk: Aqua/Water/Eau, Caprylic/Capric Triglyceride, Prunus Amygdalus Dulcis (Sweet Almond) Oil, Glycerin, Hydrogenated Polydecene, Glyceryl Stearate Citrate, Ammonium Acryloyldimethyltaurate/VP Copolymer, Butyrospermum Parkii (Shea Butter), Decyl Cocoate, Parfum/Fragrance, Aloe Barbadensis Leaf Juice, Althaea O¬cinalis Root Extract, Caprylyl Glycol, Citronellol, Distarch Phosphate, Glycine Soja (Soybean) Oil, Hydroxyisohexyl 3-Cyclohexene Carboxaldehyde, Limonene, Magnesium PCA, Manganese PCA, Panthenol, Phenoxyethanol, Rosmarinus O¬cinalis (Rosemary) Leaf Extract, Sodium Gluceptate, Sodium PCA, Zinc PCA.